Foreign Minister Mohammad Javad Zarif said on Sunday that the existing problems between Iran and France will be resolved through farsightedness and wisdom to be exercised by both sides' officials. Zarif made the remarks in a meeting with French Ambassador to Tehran Philippe Thiebaud in Tehran on Sunday. 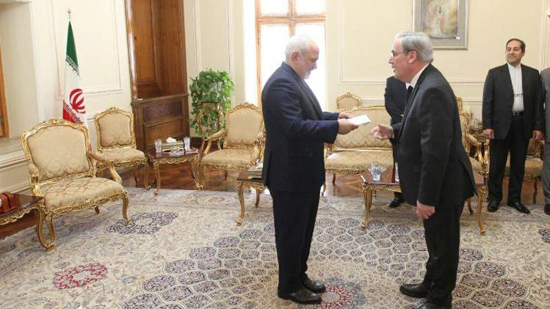 New French ambassador met with Iran's foreign minister on Sunday to submit a copy of his credentials. In this meeting, Zarif highlighted historical ties between the two countries and Iran's positive attitude towards France and called for immediate removal of problems hindering expansion of relations and cooperation between the two countries. Referring to presence of MKO terrorist group in French soil, Zarif said this is among problems between the two countries. Iran is ready to talk with French officials to help resolve regional problems, Zarif said while referring to recent dangerous developments in north of Africa such as in Libya and Sudan having roots in intervention of some regional Arab countries. Criticizing recent statement issued by G7 along with the recent views of French ambassador to the US on peaceful nature of Iran's nuclear program, he underlined that such stances will ruin nuclear deal between the two countries. As underlined in the telephone talks between the two sides' presidents, France is to play active role in the JCPOA while underlining their full supports in this end. Referring to Iran's commitment in dealing with the JCPOA, France will spare no efforts to play vital role in establishing and introducing INSTEX ( The Instrument in Support of Trade Exchanges is a special-purpose vehicle established in January 2019 by France, Germany and the United Kingdom to facilitate non-dollar trade with Iran).